Every kind of religious group has its zealots. Some of us were those zealots. 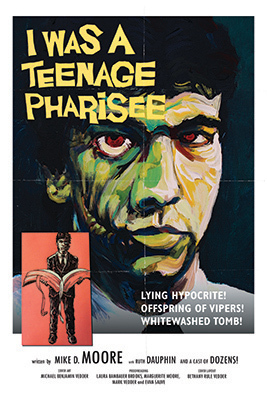 Teenage pharisees. And we bought into the thing whole-heartedly to our own spiritual detriment. We grew up without televisions, pop music, movies, dancing, cards, alcohol, voting and a thousand other little things. We sacrificed these things so as to please God and know Him and be able to share Him with others. We went to church five times a week. It sounded like this. And all that really didn't work out very well. We became prodigal's elder brothers, mnay of us. Unhappy, closed, cold, bitter, disappointed people. Old before our time. People who needed Jesus. ... a strict, rule-focussed, isolationist, piety pageant. A place where listening to Christian rock is viewed with about as much suspicion as listening to death metal. A place where haircuts and shirts can be charged political and doctrinal statements. A place you learn a great deal about sin, the devil and hell, and what "looks bad," but very little of love and mercy, grace and forgiveness. A place you go to church five times a week. A place where you learn very little about Jesus besides the fact that you sinned and so he had to die for you. A place that seems to encourage you to view him as like a protective mother, stepping between you and an abusive, control-freak father who is going to annihiliate you for breaking house rules, so that the rage can fall on her instead of her children. A place where you learn little about the fact that God makes endless variety and beauty, and sent Jesus. As a gift. Which hurt Him a great deal. Because you don't have to actually teach things that aren't true in order to skew focus and emphasis, and warp perspectives. You just need to have a weird focus that reads the bible more in terms of your own emotional baggage and daddy issues than in terms of what it's trying to say, and what it just plain doesn't. This book takes a look at what was missing in a legalistic church culture of this sort, and what it was like to go out looking for it. What it's like not to throw the Baby Jesus out with the holy water. It has quotes all throughout it from people who experienced different kinds of Plymouth Brethren groups all over the world, including the very scary Taylor-Hales Brethren. Visit the Facebook group where those who contributed to the book, and other interested people meet to discuss, well, whatever they like. Drop the author an email. The book is being posted here as an audiobook/podcast thingie absolutely free of charge. Downloadable mp3s. With songs and stuff.